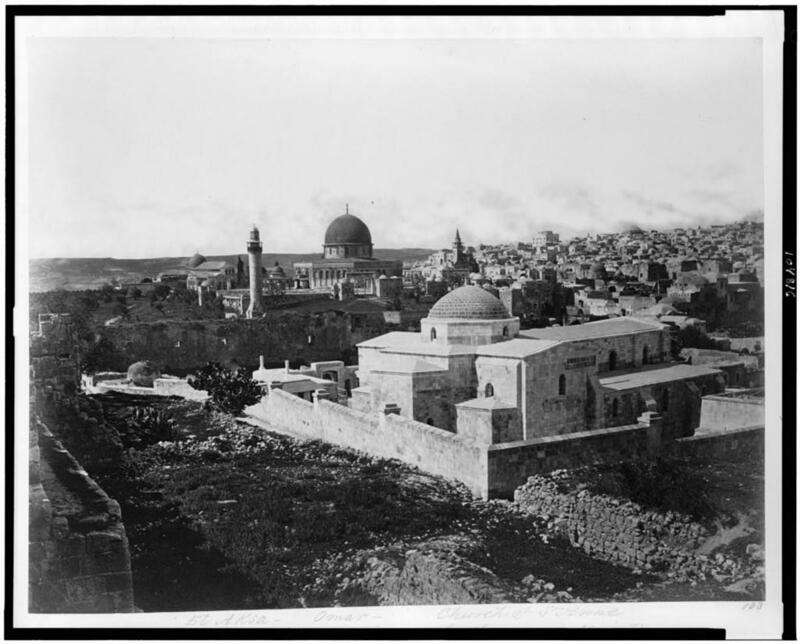 This vintage photograph from the Library of Congress collection focuses on the Dome of the Rock mosque on the Temple Mount in Jerusalem. The caption reads "General view of the Haram or [Mount] Moriah. El Aksa - Omar - Church of St. Anne." But there's something else in the photo. The photo doesn't bear the name of the photographer, nor is it certain when the photo was taken. The Library of Congress dates the picture in a 30 year period "between 1860 and 1890." In the background of the picture, on the horizon to the right of the spire, is a large building. 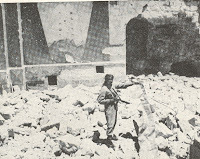 It is the uncompleted Tiferet Yisrael Synagogue in the Old City's Jewish Quarter. Construction of the synagogue began in 1857, but because of lack of funds, a domed roof could not be completed. 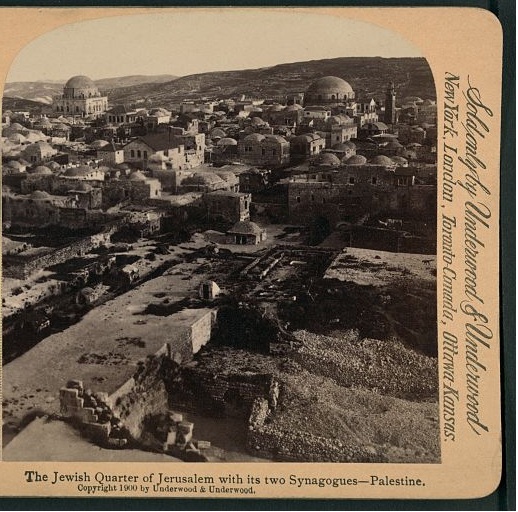 In 1870, the Austrian emperor, Franz Josef, visited Jerusalem. According to legend, upon seeing the synagogue, the emperor asked why it had no roof. 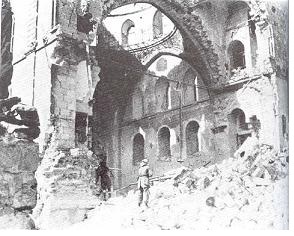 A host from the Jewish community responded, "My lord, the synagogue has taken off its hat in your honor." Franz Josef contributed funds to help complete the roof, and the building was dedicated in 1872. But we can also ascertain that the photo was taken after 1864. To the right of the Tiferet Yisrael Synagogue, on the horizon and slightly obscured by a cloud, is the dome of the famous Hurva Synagogue, completed in 1864. The featured photo was taken, therefore, between 1864 and 1872. We can also surmise that the photo of Jerusalem at the top of this blog was also taken in this time period for only the Hurva dome appears. 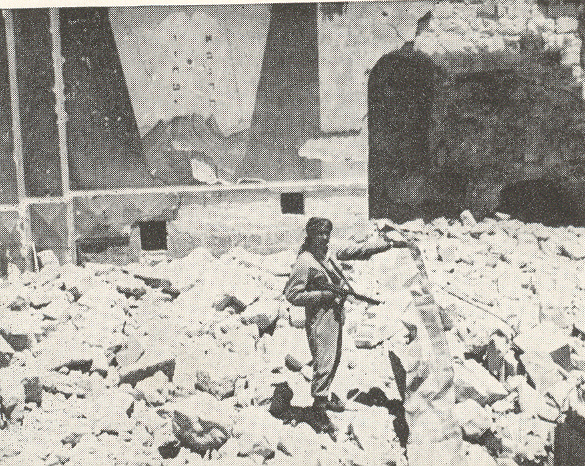 Both synagogues were destroyed by the Jordanians during and after the 1948 war. The Hurva was rebuilt and rededicated in 2010. Discussions have been held recently about rebuilding the Tiferet Yisrael Synagogue. האגדה על פרנץ יוזף ותרומת הכסף לכיפה מאד יפה אבל לא נכונה. הקיסר אכן תרם סכום נכבד לבית הכנסת לאחר ביקורו בירושלים, זאת על פי עדות עיתון החבצלת מתאריך 7 באוקטובר 1870. בידיעה נאמר שהקיסר תרם סך של אלף פרנק, איך בפירוש לא נכתב שזה היה לצורך הכיפה.